The zipper is a convenient closing mechanism that dates back to the end of the 19th century. To read the entire story on the zipper and how it got its name, please click the link. The zipper is a linear connector operated by a sliding mechanism used to join two sides together. 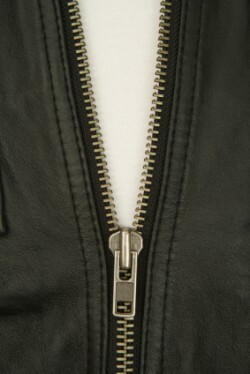 In fashion zippers are most commonly used in clothing as a replacement for buttons; though the zipper its self is used in many applications beyond clothing construction. A zipper works by using three components, each one exactingly fitted to the other. Two strips of zipper tape are used to form the right and left sides of the zipper. This tape is a ribbon of fabric with metal or plastic teeth along the edge. These teeth are meant to interlock with the teeth found on the opposite piece of zipper tape. The interlocking action is performed by a slider mechanism that travels along parallel pieces of tape aligning and interlocking the teeth. There are two schools of thought regarding the origin of the term zipper. One camp believes that zipper is in reference to the slight buzzing noise made as the clasp quickly travels over the teeth; while others believe that the term zipper came about due to the speed at which two sides of clothing could be joined. There is no proof for either theory being more correct than the other. The zipper was created over a long period of time where many inventors made marginal improvements on popular designs. The zipper that we know today was conceived in rough fashion in 1891, but was not perfected until 1914 by Gideon Sunback. Gideon’s invention of the Hookless Fastener No.2 is nearly identical to the modern day zipper that we use today. Today, on clothing, zippers are most often used as the closing mechanism on jackets, hooded sweatshirts, shirts, and fly front pants. From a non functional standpoint zippers have long been a popular accessory on punk clothing where the zipper performs only an aesthetic role and is not used to close the garment. These aesthetic zippers may be placed anywhere on the garment.